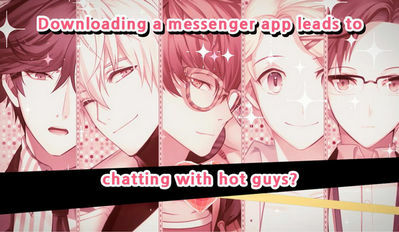 Cheritz just released the English version of its Korean dating simulator Mystic Messenger, and we have a hack for it. It’s an otome game, a narrative-driven social sim that offers female players a variety of charming anime boys to court. You are browsing your phone when you accidentally find an app called Mystic Messenger. You download it and start chatting with handsome characters, the rest of the story is for you to discover.. Mystic Messenger is a game of choices and lots of hearts. Your choices will bless or doom the future of the relationship, and hearts mean you are going along just fine! Our mod apk will unlock vip, and give you unlimited hourglass for an unrestricted gameplay experience! Latest version 1.6.9 fixed some urgent bugs, please comment if you encounter any issues. This latest version has a LOGIN BUG which will hopefully get fixed in next update. NOTE: If you get banned using this mod, don't hold me responsible! We need the update please!!! Will you update to 1.4.8? The game's at version 1.4.9, so it's asking to be updated again. Still, it's really awesome you did this in the first place! When i open the link something like ur url code blah blah blah comes..why cant i open it? Can you make mod of My Sweet Roomies? It's really appreciated if you make that game, thanks! I don't think he is gonna reply this guys, seems like that game is unhackable. Well i think Mystic Messenger is unhackable but why he can mod this thing? If he can mod Mystic Messenger, he can do My Sweet Roomies right? Correct me if i'm wrong. Do I have to be root user? no installation required? i mean i just need to install this? nothing else? Can use my old account to this? do i need to download it again when the game have an update? oh and do i have to delete the old one or it just overwrite it? Can u update again pliz? very slow internet connection around here! Quick question, can I log in with my account in this or do I have to start anew? i always say do not log in with modded games unless UnSigned apk is provided!! and I always say that I can't be held responsible if you get banned using modded games! I was banned last night and i am now stucked with the "fetching user data" part and it never leaves. What should I do? Update it to 1.5.3 version, plz. :"
Even the original version is stucked... ugh... i hope they update soon. please wait until i'm sure it's a stable version, the developers keep updating the game and most times it's not stable! Ok. Thank you for your hard work! v1.5.8 is the newest! Please update..
Hi! Please update to the latest 1.7.5 if it's okay. Thank you!